Do you buy used generators? Yes we do, please contact us for more information. Questions related to electricity or generator equipment in general. Do I need an Automatic Transfer Switch and What does it do? You do not need an automatic transfer switch (ATS) to run a back-up power generator; however, you do need a switch mechanism to transfer power to the generator. if you do not have an ATS, you will have to manual start the generator and transfer power from your home circuit to the generator via a manual switch. The cost difference between the two types of switches is minimal and the installation cost is the same. The standard power in your home is referred to as utility power and the power a generator produces is referred to as emergency power. When utility power fails (power outage or “dirty power” -high or low voltage or frequency) the ATS senses the interruption and automatically starts the generator engine and transfers the power load to it. In addition, it monitors the power supply in both utility and emergency power and chooses to use which ever power supply is the most consistent. When the utility power becomes reliable, the ATS transfers the power back to utility and shuts down the generator. How do I know what size (KVA) of generator my application will need? 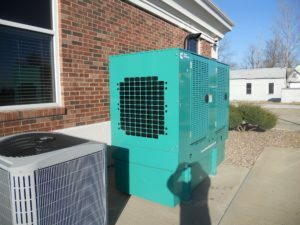 Properly sizing a standby generator is one of the most critical factors in making a purchase decision. Step 2: Determine the starting and running wattage of each item on your list. BTU’s, Amperage, and Horsepower can all be converted into Kilowatts. Step 3: Add up the total amount of KW if all items were powered at the same time. One note worth stating when dealing with residential generators, when the power is first transferred to the generator, there is an in-rush spike that cannot be calculated, the generator has to be able to handle this spike as well as the continuous load of power necessary. A load management accessory can be added to most generators that allows for items to be added to the power load in separate phases. The Load Management system can decrease the overall amount of power needed in a unit by avoiding the power spikes in the initial start-up. Load Management is normally not an issue in terms of Industrial and Commercial units. How do I know what the voltage in my region is? In the United States, all voltages in single phase are 120/240v at a frequency of 60hz and all voltages in 3 phase are 208v/240v/480v.All voltages can be adjusted if need be. Is there a difference in power output between generators that use Diesel vs Propane/Natural Gas? In standby by power, there is no difference in power output. In terms of the power load first being transferred to the generator, a diesel unit can take more in rush (spike) power due to torque than a gas unit. However, in continuous run, either fuel type will produce the same KW. In prime power (continuous run time), due to the longevity of the engine, we recommend a Diesel unit. What is the difference between 3 phase and single phase? How do I know which one I need? Most residential and light commercial sites are single phase. In commercial and industrial applications, due to the high electrical amp draw, electricians install 3 phase because its more efficient. 3 phase is mainly used on heavy motor loads. If you have a question or concern about the phase used in your application please call Power Services. What is the difference between KVA and KW ratings? Generally power sources are rated in KVA which is a direct calculation of KV (Volts/1000) times A (Amps). So a generator that can produce 100Amps at 240Volts would be 100 * 240/1000 or 24KVA. Appliances or equipment that uses electricity is generally rated in KW or KiloWatts. KW is also a ratio of Volts * Amps but with a Power Factor (PF) thrown in to compensate for variables in the power usage. Therefore as an example, a generator that produces 20KVA can run a 16KW load with a power factor of 0.8. What is the difference between stand-by power and continuous power? Stand-by power means that the generator is set to only run for exercising the unit or in the occurrence of an interruption to the regular (utility) power source. Continuous power means that the generator will be the only power source to the application running, in other words there is no utility power on site. In the generator industry, continuous is also known as Prime Power.